Dinner – 25 minutes flat! 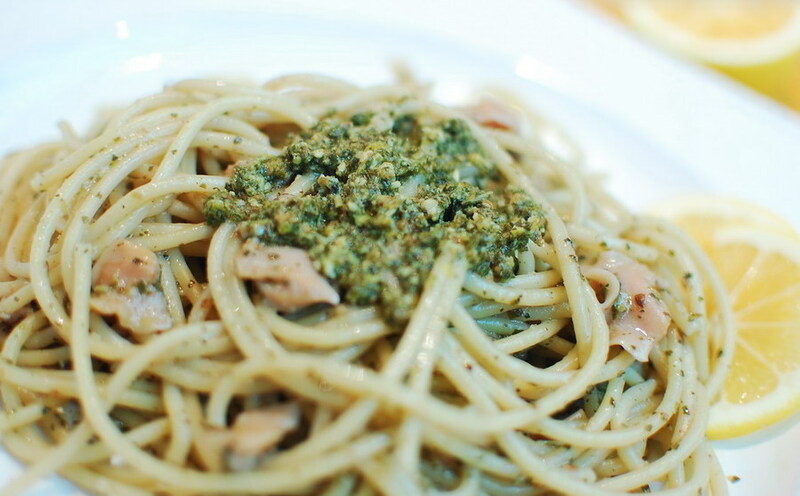 Purchased pesto, canned clams and a spritz of lemon make a one-pot pasta meal in minutes. (yeah, less dish washing!) Fresh lemon juice and zest brighten the brininess of the clams, and add a twist to traditional pesto. In summer when basil is abundant it’s nice to wiz up homemade pesto in a blender – just basil leaves, Parmesan, salt, garlic and olive oil – but this time of year, or when you’re in a hurry there are many prepared options available. I buy Trader Joe’s Genova brand refrigerated pesto. Rita’s favorite is Armanino Farms frozen pesto. Speaking of Rita, I developed this recipe for a project we worked on together at Golden Grain pasta many years ago. She is still saying how much she likes it! Prep time 25 minutes. Makes 4 entree servings. Prepare a green salad while the pasta is boiling and dinner is done! In a small dish combine 1/4 cup pesto with lemon zest. Set aside. Drain spaghetti in a colander; do not rinse. Cover with a lid to keep warm. In the same pot used for pasta, heat clams and lemon juice over medium-high heat. Simmer 2 minutes until liquid is slightly reduced. Reduce heat to low and stir in remaining 1/2 cup pesto. Add pasta to clam sauce. Stir until heated through. Top each serving with a spoonful of lemon-pesto and pass Parmesan separately. Recipe developed by Rosemary Mark for Golden Grain Pasta. Yumm. You’ve inspired me to make this for dinner tomorrow or Friday! Fortunately, I always have a container of pesto in my freezer, and the other ingredients are among my kitchen staples. This recipe was done for Golden Grain in 2002. Time flies!